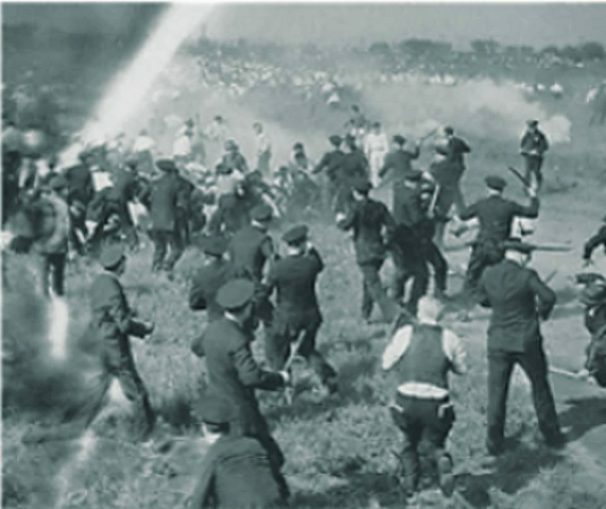 Police fire on workers during the Republic Steel strike, May 30, 1937, in Chicago. The Little Steel Strike was one of the bloodiest strikes in 1937, and a setback for labor in a year characterized by a string of union victories. Scores of unionists, supporters and family members were wounded, and 18 of their slain brothers would never return to work again. Breaking this strike — under a Democratic administration in Washington and Democratic governors across the Midwest where the pickets were killed — exposed the violent nature of the capitalist state. “Little Steel” referred to eight companies — only “Little” in comparison to “Big” U.S. Steel — that had formed a bloc to resist unionization. The Feb. 11, 1937, victory of the United Auto Workers against General Motors in the Flint, Mich., sit-down strike had set off a wave of occupations and strikes. Seeking to preempt a strike in March, U.S. Steel agreed to let the Steel Workers Organizing Committee represent workers in its mills. In the next few months about 135 steel companies let SWOC come in. The union, barely a year old, now had 330,000 members. In taking on SWOC, the eight Little Steel barons were acting on behalf of the ruling class, which wanted to push back the forward march of the Congress of Industrial Organizations (originally the Committee on Industrial Organization). Beginning as a committee inside the craft-based American Federation of Labor, the CIO formed to organize the mass of industrial workers. In 1936 the CIO’s 12 member unions were expelled from the AFL. Yet workers, inspired by successes in rubber and later in auto, flocked to the militant CIO unions by the millions. Unlike the moderate AFL, whose member unions included some that actually barred African Americans from joining, the CIO opened its doors to the most oppressed. Women, workers of color and immigrants swelled its ranks. SWOC, formed by the CIO in 1936, was no exception. The Little Steel bosses’ united front — encompassing Jones & Laughlin, Pittsburgh, Crucible, Bethlehem, Youngstown, National, Republic and Inland steel companies, led by the notorious Tom Girdler of Republic — began to crumble in May when J & L signed with SWOC after a 36-hour strike. Then Pittsburgh and Crucible gave in. The union struck three holdouts, Republic, Youngstown and Inland, on May 26, and shortly thereafter workers walked out at one of Bethlehem’s plants. SWOC held off taking on National, whose president, Ernest T. Weir, was one of the worst anti-unionists in the whole country. Altogether 92,000 steelworkers in seven states were on picket lines; mills were shut down lock-tight. Just four days into the strike on May 30, Republic strikers in Chicago were having a Memorial Day social with their families at Sam’s Place, SWOC’s local headquarters. Leo Krzycki, of the Amalgamated Clothing Workers and a leading figure in the CIO, pledged support. A statement from the Chicago mayor affirmed the right to peacefully picket. Having that statement in hand, the strikers at the social voted to march to the mill and picket. A newsreel showed strike leaders pleading with police to let them pass. Police instead opened fire and clubbed workers mercilessly. One died after some workers tried to get him in a car and drive him to the hospital; police dragged him out of the car and left him to die. Four were dead on the spot. In the next few weeks the death toll climbed to 10, nine from gunshot wounds and one bludgeoned to death. Over 100 were wounded, many incapacitated for life. The injured included infants and children. Every year, steelworkers and other Chicago unionists gather at the site of the slaughter to remember those who laid down their lives in the service of their class. Part 2: Strike violence continues. Seven murdered in Ohio.